Posted by Duncan in Look and Feel, PeopleTools, PIA, Strategy. I posted a video yesterday showing some of the work we’d done at Pret and thought I’d add a little more technical detail and some clearer screenshots. The users were broken down into different populations: Employees, Managers and Head Office/power users; each function having a different dashboard. Everyone has the Employee Self Service dashboard, only a subset get one or other of the other two. 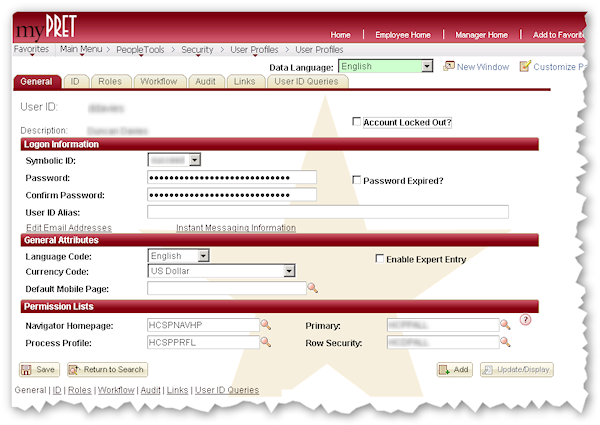 Employees are automatically redirected on sign-on to the correct homepage. The buttons along the top are the top level menu items. These are dynamically read from the PeopleSoft Portal Registry, clicking one shows a side menu and so on down the menu hierarchy etc. 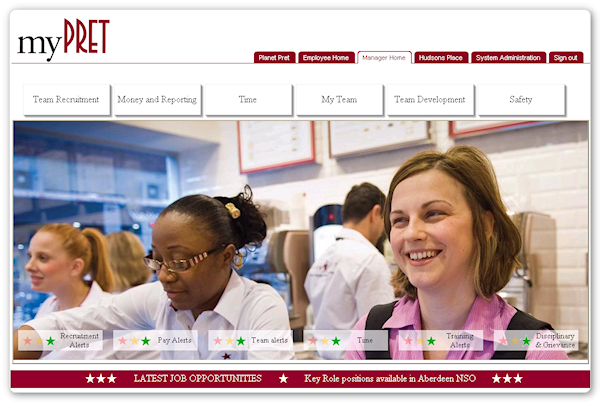 You’ll also see a burgundy footer bar (this uses jQuery to fade between different messages to communicate to the managers). Towards the lower half of the picture are a series of traffic lights showing the status of different KPIs within the business – this uses Succeed’s Alerts Framework as the technology to make this simple and configurable. The Employee experience is a good deal less formal again. Although they can access all of the expected functionality (timesheets, rotas, holiday booking, personal data changes, payslips etc) from the menu bar there are other aspects to make the experience compelling and keep the usage high. The main content area of the homepage is used for displaying news items. These are fully configurable and the amount shown and topics changes from week to week. The comms team can upload PDFs to be linked to, or can write news items to be published using the Rich Text editor. Everything is stored within PeopleSoft. On the right is an employee poll. Every employee gets to vote online and once you select an answer the running total is displayed showing how the other employees voted. Across the top there is a sprinkling of social media goodness. There is a heap of other functionality not shown, some colleagues have done some great work on integration with Google maps, others have taken the most complex of requirements for timesheets/rotas and produced some elegant pages. This was all achieved using just PeopleSoft … no other products were used for hosting portals etc. It’s all built within PeopleTools and shows what can be done when a client is willing to move a little away from the ‘zero customisation’ mantra. If you’d like a little more detail on what we did and how we did it – particularly if it’s a path that you’d be interested in following yourself – please get in touch.